The Hague (; Dutch: Den Haag pronounced ( ) or 's-Gravenhage pronounced ( )) is the seat of government in the Netherlands, and the capital city of the province of South Holland. With a population just over 500,000 inhabitants (as of 1 November 2012) and more than one million inhabitants including the suburbs, it is the third-largest city of the Netherlands, after Amsterdam and Rotterdam. The combined urban area of The Hague and Rotterdam, with a population of approximately 2.9 million, is the 206th-largest urban area in the world and the most populous in the country. Located in the west of the Netherlands, The Hague is in the centre of the Haaglanden conurbation and lies at the southwest corner of the larger Randstad conurbation. The Hague is the seat of the International Court of Justice and the International Criminal Court, which makes The Hague one of the major cities hosting the United Nations, along with New York, Brussels, Geneva, Bonn, Vienna, Tokyo and Nairobi. 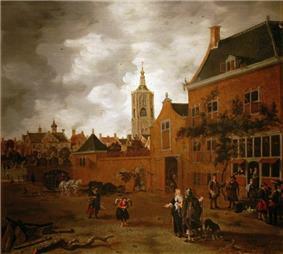 Street in The Hague by Sybrand van Beest, c. 1650, Royal Castle in Warsaw. The Hague originated around 1230, when Count Floris IV of Holland purchased land alongside a pond, the present-day Hofvijver, in order to build a hunting residence. In 1248, his son and successor William II, King of the Romans, decided to extend the residence to a palace, which would later be called the Binnenhof (Inner Court). He died in 1256 before this palace was completed but parts of it were finished by his son Floris V, of which the Ridderzaal (Knights' Hall), still intact, is the most prominent. 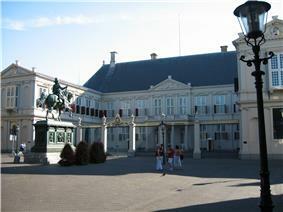 It is still used for political events, such as the annual speech from the throne by the Dutch monarch. From the 13th century onwards, the counts of Holland used The Hague as their administrative centre and residence when in Holland. The village that originated around the Binnenhof was first mentioned as Haga in a charter from 1242. In the 15th century, the smarter des Graven hage came into use, literally "The Count's Wood", with connotations like "The Count's Hedge, Private Enclosure or Hunting Grounds". Gravenhage was officially used for the city from the 17th century onwards. Today, this name is only used in some official documents like birth and marriage certificates. The city itself uses "Den Haag" in all its communication. When the Dukes of Burgundy gained control over the counties of Holland and Zeeland at the beginning of the 15th century, they appointed a stadtholder to rule in their stead with the States of Holland as an advisory council. Their seat was located in The Hague. At the beginning of the Eighty Years' War, the absence of city walls proved disastrous, as it allowed Spanish troops to easily occupy the town. In 1575, the States of Holland even considered demolishing the city but this proposal was abandoned, after mediation by William of Orange. From 1588, The Hague also became the seat of the government of the Dutch Republic. In order for the administration to maintain control over city matters, The Hague never received official city status, although it did have many of the privileges normally granted only to cities. 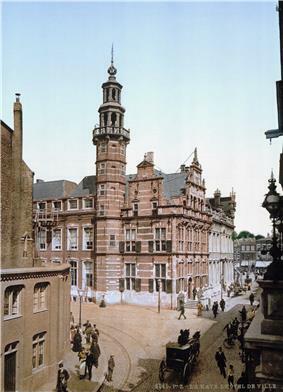 The Old City Hall of The Hague around 1900. Only in 1806, when the Kingdom of Holland was a puppet state of the First French Empire, the settlement was granted city rights by Louis Bonaparte. After the Napoleonic Wars, modern-day Belgium and the Netherlands were combined in the United Kingdom of the Netherlands to form a buffer against France. As a compromise, Brussels and Amsterdam alternated as capital every two years, with the government remaining in The Hague. After the separation of Belgium in 1830, Amsterdam remained the capital of the Netherlands, while the government was situated in The Hague. When the government started to play a more prominent role in Dutch society after 1850, The Hague quickly expanded. Many streets were specifically built for the large number of civil servants employed in the country's government and for the Dutchmen who were retiring from the administration of the Netherlands East Indies. The growing city annexed the rural municipality of Loosduinen partly in 1903 and completely in 1923. After the war, The Hague was, at one point, the largest building site in Europe. The city expanded massively to the south west and the destroyed areas were quickly rebuilt. The population peaked at 600,000 inhabitants around 1965. In the 1970s and 1980s, mostly white middle-class families moved to neighbouring towns like Voorburg, Leidschendam, Rijswijk and, most of all, Zoetermeer. This led to the traditional pattern of an impoverished inner city and more prosperous suburbs. Attempts to include parts of these municipalities in the city of The Hague were highly controversial. In the 1990s, with the consent of Dutch Parliament, The Hague annexed fairly large areas from neighbouring towns as well as from not even bordering ones, on which the complete new residential areas were built and are still being built. 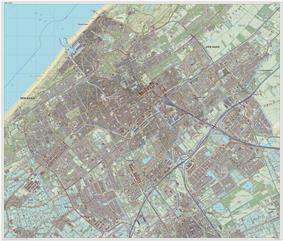 Detailed topographic map of The Hague, Sept. 2014. The Hague, divided into neighbourhoods. The Hague is the Netherlands' largest city on the North Sea in the southwest of the South Holland province and forms the centre of a conurbation called Haaglanden. Westland and Wateringen lie to the south, Delft and the Rotterdam conurbation (called Stadsregio Rotterdam or Rijnmond) to the southeast, Nootdorp, Pijnacker, Rijswijk and Voorburg to the east, Zoetermeer and Voorschoten to the northeast and Wassenaar and Leidschendam-Voorburg and the Leiden conurbation to the north. The conurbations around The Hague and Rotterdam are close enough to be a single conurbation in some contexts. 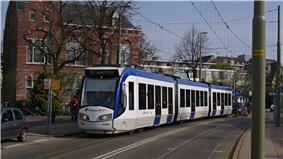 For example, they share the Rotterdam The Hague Airport and a light rail system called RandstadRail. Consideration is being given to creating a Rotterdam-The Hague metropolitan area. This large conurbation centred on The Hague and Rotterdam is, in turn, part of the Randstad - specifically a band of municipalities called the South Wing (Zuidvleugel). The Randstad, which also includes among others Amsterdam and Utrecht, has a population of 6,659,300. The Hague lies at the south-western corner of one of the largest urban areas in Europe. The Hague is divided into eight official districts which are, in turn, divided into neighbourhoods. Some of the most prosperous and some of the poorest neighbourhoods of the Netherlands can be found in The Hague. The wealthier areas like Statenkwartier, Belgisch Park, Marlot, Benoordenhout and Archipelbuurt are generally located in the north western part of the city, closer to the sea, whereas the south eastern neighbourhoods like Transvaal, Moerwijk, and the Schilderswijk are significantly poorer, with the exception of the Vinex-locations of Leidschenveen-Ypenburg and Waterings Veld. This division is reflected in the local accent: The more affluent citizens are usually called "Hagenaars" and speak so-called bekakt Haags ("posh"), this contrasts with the Hagenezen, who speak plat Haags ("vulgar"); see Demographics below. Escamp (118,483 inhabitants) is the most populous district of The Hague, built largely after the Second World War as part of The Hague's large expansion to the south east. One railway station can be found here: Den Haag Moerwijk. The district is divided into six neighbourhoods. Haagse Hout (42,000 inhabitants) is a wealthy district in the north east of the city and the location of the Haagse Bos, a large forest. The King of the Netherlands lives in the royal palace Huis ten Bosch, located in this forest. The district also includes the financial centre of the city, the Beatrixkwartier. Laak (40,222 inhabitants) is the smallest district of the city, south east of its centre, for the most part, built in the 20th and 21st century. The area used to be part of Rijswijk, until the municipality of The Hague bought the land in 1844. The Hollands Spoor railway station and The Hague University are located here, as well as the site of the planned mixed use development Nieuw Binckhorst. Leidschenveen-Ypenburg (47.088 inhabitants) is an early 21st-century Vinex-location located south east of the city, geographically connected to the main body of the city only by a narrow corridor. The district is divided into Leidschenveen and Ypenburg, which were part of Leidschendam, Nootdorp and Rijswijk before the areas were annexed by The Hague in 2002. This was the site of Ypenburg Airport which was a military airport during the Second World War. Loosduinen (45.485 inhabitants) is the westernmost district of The Hague. It was a village unto itself until 1923, when it was annexed by The Hague. The less popular of the city's two seaside resorts, Kijkduin is located here. The district is divided into four neighbourhoods. Scheveningen (53.425 inhabitants) is the wealthy northernmost district of The Hague. A modern beach resort, Scheveningen is a popular tourist destination. It has a long sandy beach and its own esplanade, pier and lighthouse, but also a Pathé cinema, a musical theatre and a casino. The district also includes a fishing harbour. Notable buildings include the Kurhaus and farther inland, the Peace Palace. Segbroek (60.054 inhabitants) is a district located between Scheveningen and Loosduinen. The population has decreased over the last few decades, a trend which is expected to persist. It became a district of The Hague in 1988 and is divided into five neighbourhoods. The Hague experiences a temperate oceanic climate (Köppen climate classification Cfb) similar to almost all of the Netherlands. With its location on the coast, it experiences slightly milder winter and summer temperatures than inland locations. It also gets more sunshine. 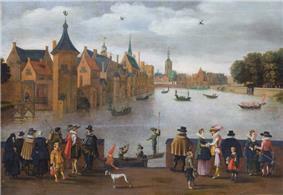 City life concentrates around the Hofvijver and the Binnenhof, where the Parliament is located. Because of its history, the historical inner city of The Hague differs in various aspects from the nearby smaller cities of Leiden and Delft. It does not have a cramped inner city, bordered by canals and walls. Instead, it has some small streets in the town centre that may be dated from the late Middle Ages and several spacious streets boasting large and luxurious 18th-century residences built for diplomats and affluent Dutch families. It has a large church dating from the 15th century, an impressive City Hall (built as such) from the 16th century, several large 17th-century palaces, a 17th-century Protestant church built in what was then a modern style, and many important 18th-century buildings. The city is becoming more student friendly with the introduction of a new campus in 2012 of Leiden University as well as Leiden University College The Hague, which was established in 2010. The Royal Conservatory of The Hague and The Royal Academy of Art are also located there, as well as The Hague University, a vocational university and a branch of The Open University of the Netherlands. The city has many civil servants and diplomats. In fact, the number and variety of foreign residents (especially the expatriates) make the city quite culturally diverse, with many foreign pubs, shops and cultural events. The tallest buildings of The Hague are both 146-metre-tall ministries of Security and Justice and the Interior and Kingdom Relations of the Netherlands, designed by Hans Kollhoff. Other significant skyscrapers include the Hoftoren, New Babylon, Het Strijkijzer and De Kroon. As of 1 January 2014, The Hague counts 509,779 inhabitants, making it the third largest city of the Netherlands. Between 1800 and 1960, the city saw a considerable growth from 40,000 in 1800 to 200,000 in 1900 and eventually 600,000 in 1960. The growth following 1900 was partially caused by the housing act of 1901, which stimulated the expansion of cities such as The Hague. In the period between 1960 and 1980, The Hague saw a shrinkage from 600,000 to 440,000 inhabitants, caused mostly by the spacial policy, demographic processes and lack of space. After several annexations and housing construction, The Hague has since grown again, celebrating its 500,000th inhabitant in 2011. The municipality expects the growth to continue to 513,000 inhabitants in 2020. The proportion of Dutch people is 49.9%, while that of Western immigrants is 15.6%, and that of non-western immigrants is 34.4%. Just over half of The Hague's population considers themselves religious. The two most popular religions are Christian (32%) or Muslim (16%). Turks, Moroccans and Surinamese people belong to a religion more often than average. Islam is the most common religion among Turks and, particularly, among Moroccans. Among Surinamese people, it is more mixed, although Hinduism is the most common. Of The Hague's autonomous population, almost all religious people belong to Christianity. Just under 40% of the population of The Hague regularly attends a house of worship. The demonym of The Hague officially is Hagenaar, but the term Hagenees is informally used for someone who was born and grew up in The Hague. It is believed by some that there is a separation between Hagenaars living on sand, and Hagenezen living on peat. The Hague is built partially on sand dunes and partially on peat; the border roughly runs parallel to the Laan van Meerdervoort. Generally the wealthier neighbourhoods lie on sand, and the poorer neighbourhoods on peat. People that live on the sand are Hagenaars, those that live on peat are Hagenezen. Another definition is that a Hagenees is someone speaking in the vulgar Haags accent, whereas a Hagenaar speaks in the more "posh" Haags accent. As of the 2014 municipal elections, The Hague's municipal legislative contains thirteen parties, most notably the D66 (8 seats), the PVV (6 seats) and the PvdA (6 seats). After the elections, the municipal executive was formed by a coalition existing of D66, PvdA, VVD, HSP and CDA. The chairman of the college is mayor Jozias van Aartsen of the VVD, and the city has six aldermen (or deputy mayors): Ingrid van Engelshoven (D66), Rabin Baldewsingh (PvdA), Joris Wijsmuller (HSP), Boudewijn Revis (VVD), Karsten Klein (CDA) and Tom de Bruijn (D66). Each of these is responsible for a number of particular policy areas and one or two city district. The city of The Hague contributes substantially to international politics: The Hague is home to over 150 international organisations. These include the International Court of Justice (ICJ), the International Criminal Court (ICC), the International Criminal Tribunal for the former Yugoslavia (ICTY), and the Appeals Chamber of the International Criminal Tribunal for Rwanda (ICTR). The Hague is the fourth major centre for the United Nations, after New York, Geneva and Vienna. In line with the city's history as an important convention center and the current presence of institutions such as the ICJ, The Hague's city council employs a city branding strategy that aims to establish The Hague as the Legal Capital of the World and the International City of Peace and Justice. The foundation of The Hague as an Permanent Court of Arbitration (PCA). Shortly thereafter the Scottish-American millionaire Andrew Carnegie made the necessary funds available to build the Peace Palace to house the PCA. 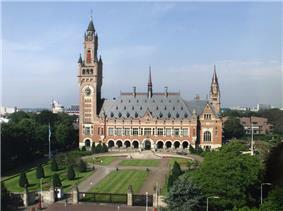 After the establishment of the League of Nations, The Hague became the seat of the Permanent Court of International Justice, which was replaced by the UN's International Court of Justice after the Second World War. The establishments of the Iran-US Claims Tribunal (1981), the International Criminal Tribunal for the former Yugoslavia (1993) and the International Criminal Court (2002) in the city further consolidated the role of The Hague as a center for international legal arbitration. Most recently, on 1 March 2009, the Special Tribunal for Lebanon, a U.N. tribunal to investigate and prosecute suspects in the 2005 assassination of Lebanese Prime Minister Rafik Hariri, opened in the former headquarters of the Netherlands General Intelligence Agency in Leidschendam, a town within the greater area of The Hague. International Criminal Tribunal for Rwanda (ICTR, appeals court only). The tribunal itself is in Arusha, Tanzania. Permanent Court of Arbitration, the oldest institution for international dispute resolution. In 1948 The Hague Congress was held with 750 delegates from 26 European countries, providing them with the opportunity to discuss ideas about the development of the European Union. The Hague has a policy to partner with various countries of origin of its citizens. Since 2002 The Hague co-operates with Suriname. 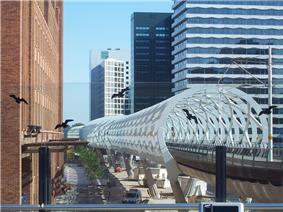 The Hague's central financial district, Beatrixkwartier, with the modern tram viaduct called the Netkous (Fishnet Stocking). The Hague has a service-oriented economy. Professional life in the city is dominated by the large number of civil servants and diplomats working in the city; as of 2006, 26% of the jobs in The Hague are those offered by the Dutch government or the international institutions. Large employers in this sector include the ministries of Defence, Justice, Housing, Spatial Planning and the Environment, Foreign Affairs, the Interior and Transport, Public Works and Water Management. Several large international businesses have their headquarters in The Hague, including Royal Dutch Shell, the world's second largest company in terms of revenue. Other significant companies headquartered in The Hague include Aegon, APM Terminals, KPN (Koninklijke PTT Nederland), Nationale Nederlanden, NIBC Bank and PostNL. There has never been any large-scale industrial activity in The Hague, with the possible exception of the fishing activities of the harbour in Scheveningen. Many of the city’s logistical and minor-industrial services are located in the Binckhorst in the Laak district, which contains many sizeable warehouses. Tourism is an important sector in The Hague. The city is the Netherlands' second biggest tourist destination, after Amsterdam. In 2012, the city welcomed 1.2 million tourists (an increase of 80,000 compared to the previous year), half of whom came from abroad. The number of hotel nights in The Hague increased by 5%; in particular, visitors from neighbouring countries are finding their way to The Hague. Compared to 2011 Belgians booked 27% more hotel nights, while the Germans were good for 24% more hotel nights, and the French booked 20% more hotel nights. The 14% average increase in visits by foreign tourists more than compensated for the slight decrease of less than 1% by Dutch visitors. Tourists spend an average of € 2 billion a year in the local economy. Today 1 in 10 residents make their living from the tourism sector. The Ridderzaal inside the Binnenhof, the political centre of the Netherlands. Monument commemorating the founding of the Kingdom of the Netherlands at Plein 1813. The Hague originated around the 13th century Binnenhof, and this is still considered the cultural centre of the city. Night life centres around the three main squares in the city centre. The Plein (literally "Square") is taken by several large sidewalk cafés where often politicians may be spotted. The Grote Markt (literally "Great Market") is completely strewn with chairs and tables, summer or winter. The Buitenhof (literally "Outer Court", located just outside the Binnenhof) contains a six screen Pathé cinema and a handful of bars and restaurants in the immediate vicinity. Adjacent to the Buitenhof is De Passage, the country's first covered shopping mall. Dating from the late 19th century, it contains many expensive and speciality shops. One of the country's largest music venues, Paard van Troje, can be found in the centre of The Hague. Another popular music venue in The Hague is Muziekcafé de Paap. The Spuiplein is a modern fourth square in the city centre, opposite the Nieuwe Kerk. Besides the City Hall, this is also the location of the Dr. Anton Philipszaal, home to the Residentie Orchestra, and the Lucent Danstheater, home to the internationally celebrated modern dance company Nederlands Dans Theater. These buildings, designed by Rem Koolhaas in 1988, are planned for demolition to make space for a new theatre, the Spuiforum, which would house both institutes as well as the Royal Conservatory. Despite efforts of the municipality, public support for the proposed theatre remains low. At the heart of the city centre across the palace gardens is the home of Summerschool Den Haag, international school for dance with guestteachers such as Valentina Scaglia, Igone de Jongh, and Maia Makhateli. The Koninklijke Schouwburg, home to the Nationaal Toneel, can also be found in the city centre - on the Korte Voorhout. New European Ensemble is an ensemble for contemporary music consisting on international musicians. The ensemble has its main base in the city. Scheveningen forms a second cultural centre of The Hague, having its own Pathé cinema as well as the musical theatre Circustheater although, especially in the summer, most night life concentrates around the sea-front boulevard with its bars, restaurants and gambling halls. Several other attractions can be found in Scheveningen, such as the miniature city Madurodam, the panoramic painting Panorama Mesdag, and Europe's first 360° IMAX-cinema the Omniversum. 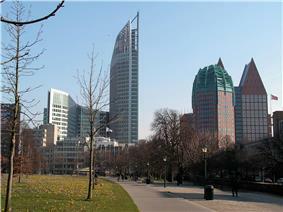 Several films have been (partially) shot in The Hague, including Hum Tum (2004), Ocean's Twelve (2004) and Zwartboek (2006). An alternative music video of Coldplay's Viva la Vida was also shot in The Hague. The city's major football club is ADO Den Haag. They play in the Eredivisie (the top division in the Netherlands). They are two time winners of the KNVB Cup and won the League twice in the era before professional football. They play their matches at the 15,000 seat Kyocera Stadion. Cricket is traditionally one of the most popular sports in The Hague, with a number of strong teams from the Dutch league located there. The local rugby union team is Haagsche Rugby Club (a.k.a. HRC) and has been in the Guinness Book of Records for becoming Dutch (in adult and youth) champions so often. The ice hockey team is HYS The Hague. The handball team is SV Wings, active in the top division. The local American Football team is Den Haag Raiders'99. In 1994, The Hague held the FEI World Equestrian Games. Every third Tuesday in September is Prinsjesdag, or Prince's Day, the opening of Dutch parliament. A festive day, children in The Hague are free from school so they may watch the procession of the Golden Carriage. The King is driven in the Golden Carriage from Noordeinde Palace to the Ridderzaal in the Binnenhof. Here, the King reads the Speech from the Throne, written jointly by the Ministers and Secretaries of State. This troonrede outlines the government's plans for the coming year. As the procession returns to the Noordeinde Palace, the road is lined with members of the Dutch Royal Armed Forces and in the afternoon the Royal Family appears on the palace balcony to address an adoring and often frenzied public (balkonscène). Vlaggetjesdag, literally Flag Day is the annual celebration of the arrival of the year's first herring (Hollandse Nieuwe) in Scheveningen. Hundreds of thousands of people gather in Scheveningen for the festivities, and the fishing boats are decorated especially for the occasion. In addition to the omnipresent herring, this day also features a number of activities unrelated to fish. In Scheveningen, the first barrel of herring is traditionally sold at an auction on the Thursday preceding the official Vlaggetjesdag, and the proceeds go to charity. Vlaggetjesdag was made official in 1947. The festive tradition around the beginning of herring season is much older, however. In the 18th century, the villages along the coast, including Scheveningen, were forbidden to gut the caught herring. Since herring was most appropriate for smoking around September, most fishing boats fished flatfish or round-bodied fish during a part of the summer so as to avoid a surplus of fresh herring. In July or August, The city hosts a series of weekly firework displays by the sea front in Scheveningen, as part of an international fireworks festival and competition. Tong Tong Fair, formerly Pasar Malam Besar, is the largest festival in the world for Indo culture. Established in 1959, it is one of the oldest festivals and the fourth largest grand fair in the Netherlands. It is also the annual event with the highest number of paying visitors of The Hague, having consistently attracted more than 100,000 visitors since 1993. The Milan Festival is Europe’s biggest Hindustani open air event, annually held in Zuiderpark. The Hague also hosts several annual music festivals. The last Sunday in June, the city hosts Parkpop, the largest free open air pop concert in Europe. Crossing Border Festival, State-X and The Hague Jazz festival are among other music festivals in The Hague. Moreover, The Hague International Model United Nations, annually in January, is a five-day conference held at the World Forum, gathering over 4,000 students from over 200 secondary schools across the globe. It is the oldest and largest high school United Nations simulation in the world. Den Haag Sculptuur is an open air exhibition of sculptures. The 10th edition, in 2007, celebrated the 400 years of the relationship between the Netherlands and Australia. Since 2009, the city of The Hague also annually presents a LGBT-emancipation award called the John Blankenstein Award. The exact date of the ceremony varies each year. There are two main railway stations in The Hague: Hollands Spoor (HS) and Centraal Station (CS), only 1.5 kilometres (1 mile) distant from each other. Because these two stations were built and exploited by two different railway companies in the 19th century, east-west lines terminate at Centraal Station, whereas north-south lines run through Hollands Spoor. Centraal Station does, however, now offer good connections with the rest of the country, with direct services to most major cities, for instance Amsterdam, Rotterdam and Utrecht. RandstadRail connects The Hague to nearby cities, Zoetermeer, Rotterdam and Leidschendam-Voorburg. It consists of four light rail lines (2, 3, 4 and 19 to Zoetermeer, Rijswijk, Delft and Leidschendam-Voorburg) and one subway line (E to Rotterdam). Major motorways connecting to The Hague include the A12, running to Utrecht and the German border. The A12 runs directly into the heart of the city in a cutting. Built in the 1970s, this section of motorway (the "Utrechtsebaan") is now heavily overburdened. Plans were made in the late 1990s for a second artery road into the city (the "Rotterdamsebaan" or previously called "Trekvliettracé") which is due to be built between 2016 and 2019. Other connecting motorways are the A4, which connects the city with Amsterdam, and the A13, which runs to Rotterdam and connects to motorways towards the Belgian border. There is also the A44 that connects the city to Leiden, Haarlem and Amsterdam. In the 1970s, plans of building another motorway to Leiden existed. This "Leidsebaan" was supposed to start in the city centre and then follow the railway line The Hague - Amsterdam. Some works have been executed, but removed already in the 1980s. ^ "Burgemeester Jozias van Aartsen" [Mayor Jozias van Aartsen] (in Dutch). Gemeente Den Haag. 17 May 2013. Retrieved 25 July 2013. ^ "Het college van burgemeester en wethouders" [Board of mayor and aldermen] (in Dutch). Gemeente Den Haag. 23 May 2013. Retrieved 25 July 2013. ^ "Kerncijfers wijken en buurten" [Key figures for neighbourhoods]. CBS Statline (in Dutch). ^ "Bevolkingsontwikkeling; regio per maand" [Population growth; regions per month]. CBS Statline (in Dutch). ^ Daum, Andreas (2005). Berlin - Washington, 1800–2000 Capital Cities, Cultural Representation, and National Identities. Cambridge University Press. pp. 13, 38. ^ s-Gravenhage / Den Haag"'". Taaladvies.net. Retrieved 2012-11-16. ^ "Bombardement op Bezuidenhout maart 1945" [Bombing of the Bezuidenhout March 1945] (in Nederlands). ^ Stichting Ons Erfdeel (1998). The Low Countries: arts and society in Flanders and the Netherlands, a yearbook 9. Flemish-Netherlands Foundation. p. 113. ^ "Stadsdelen" (in Dutch). Denhaag.nl. 18 October 2010. Retrieved 31 August 2011. ^ "Klimaattabel Valkenburg, langjarige gemiddelden, tijdvak 1981–2010" (in Dutch). ^ "Klimaattabel Valkenburg, langjarige extremen, tijdvak 1971–2000" (in Dutch). Royal Netherlands Meteorological Institute. Retrieved 10 September 2013. ^ "Bevolkingsprognose Den Haag 2012-2020". DenHaag.nl (in Nederlands). 10 April 2012. Retrieved 25 November 2013. ^ (Dutch) Den Haag in Cijfers. ^ "Burgerschapsmonitor (2009)". DenHaag.nl (in Nederlands). 28 September 2009. Retrieved 25 November 2013. ^ "Zetelverdeling, coalitie en oppositie". Den Haag (in Dutch). Retrieved 21 July 2014. ^ "Het college van burgemeester en wethouders". Den Haag (in Dutch). Retrieved 21 July 2014. ^ "Miasta partnerskie Warszawy". um.warszawa.pl. Biuro Promocji Miasta. 4 May 2005. Retrieved 29 August 2008. ^ "Fortune 500 2013". Retrieved 10 July 2013. ^ More tourists visiting The Hague. Denhaag.nl. 7 May 2013 (last update 18 July 2013). Retrieved 25 October 2013. ^ Tourism sector growing in The Hague. Denhaag.nl. 24 October 2013. Retrieved 25 October 2013. ^ "Den Haag - Haagse weetjes". Denhaag.nl. 2010-07-12. Retrieved 2012-11-16. ^ "King’s Day (Koningsdag)". Denhaag.nl. 11 November 2013. Retrieved 19 April 2013. ^ "The Hague turns Orange on King’s Day!)". Denhaag.nl. 26 March 2014. Retrieved 19 April 2013. ^ "Prince’s Day (Prinsjesdag)". Denhaag.nl. 26 August 2013. Retrieved 19 April 2013. ^ "Vlaggetjesdag (Flag Day)". Denhaag.nl. 19 July 2013. Retrieved 19 April 2013. ^ "Music City The Hague". Denhaag.nl. 23 August 2012. Retrieved 19 April 2013.